Be the first to share your favorite memory, photo or story of Barbara Ann. This memorial page is dedicated for family, friends and future generations to celebrate the life of their loved one. 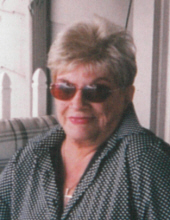 Barbara Ann (Robinson) Carter Russell, 84, of Middletown, died Tuesday, April 2, 2019, at her home. She was born in Jackson, Kentucky on December 24, 1934 to parents Charles and Velma Robinson. Barbara had worked as a bartender in the restaurant industry. She was a history buff, especially politics, loved Jeopardy!, trivia, Antiques Roadshow and keeping up with current events with FOX News. Mrs. Russell is survived by her daughter, Roxanne (Michael) Williams; niece & caregiver, Tina Myers; brothers, Davey Robinson & Fred Robinson; sisters, Betty Dennis, Shirley Davis & Phyllis "Robbie" McClain; two grandchildren, Michael Williams Jr. & Meagan (David) Jennings; seven great grandchildren, Noah Williams, Gabriel Williams, Aidan Speer, Ciara Speer, Brooke Laforce, Wyatt Laforce & Shanda Jennings; as well as many other loving nieces, nephews & extended family members. She was preceded in death by her first husband, Rodney H. Carter; second husband, Thomas N. Russell; parents; and brothers, Clyde Robinson & Amos Robinson. Graveside service will be held Friday, April 5, 2019 at 1:00 pm at Woodside Cemetery (Section 27), 1401 Woodside Blvd., Middletown with Gary Dennis officiating. Memorial donations may be made to Grace Hospice, 4850 Smith Rd., Suite 100c, Cincinnati, Ohio 45212. To send flowers or a remembrance gift to the family of Barbara Ann (Robinson) Carter Russell, please visit our Tribute Store. "Email Address" would like to share the life celebration of Barbara Ann (Robinson) Carter Russell. Click on the "link" to go to share a favorite memory or leave a condolence message for the family.